TIP: If you prefer not to use sour dough bread for your stuffing, any bread of your choice is fine. Prepare your turkey (rinse it if you like), pat dry and place in a roasting pan. Stuff the cavity of the turkey with the chopped lemons and fresh rosemary sprigs. Make sure the skin from the neck of the turkey fully covers the back portion of the turkey, and that the legs and wings are tucked in. In a bowl combine the fresh chopped rosemary, fresh chopped thyme, salt & pepper and the 1/2 cup butter. Mix well. 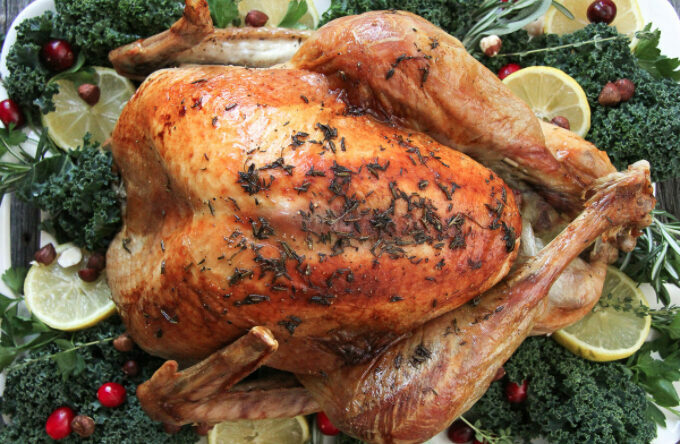 Rub the turkey with the butter and herb mix, making sure to butter all of the turkey (the breast, wings and legs). Place the turkey into the oven and immediately TURN DOWN the heat to 350 degrees. 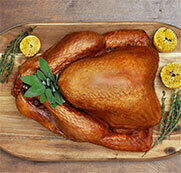 Roast for 35 - 40 minutes per 2 lbs., so a turkey of this size will need to roast for approximately 3 to 3 1/2 hours. The turkey is done when the thigh meat reaches an internal temperature of 165 - 170 degrees F.
When the turkey is done, remove it from the oven, cover it in tin foil and let rest about 15 - 30 minutes, or long enough to get the rest of your dinner together. In a deep ovenproof dish like an enamel pot, melt the butter over low-medium heat. Add the chopped celery, onions and leek and cook until tender. Add the bread cubes, and mix until the bread is coated in butter. Add salt, pepper, sage, thyme, raisins, apples and hazelnuts. Mix well. If you find that your stuffing is too dry at this point, add some turkey broth until it's how you want it. Sometimes I have to add up to one cup. Bake, covered, for 45 minutes. After 45 minutes, uncover and bake for 30 more minutes, stirring once or twice.